Our tax code is threatening the financial stability of working class families like never before, and families of color are threatened further still by the ever-growing racial wealth divide. Fair Shot 2020 is a $1.5 million campaign to create a fair and stable U.S. economy—by providing families and children of color with a fair shot at creating and protecting their financial well-being. Together, we can advance equitable federal and state policies that benefit all Americans. Working families are historically disadvantaged by the tax code. The new Tax Cuts and Jobs Act passed in December 2017 takes this historical disadvantage to new heights and further jeopardizes the stability of low- and middle-income families. Our tax code is at the heart of growing economic inequality in the United States. By and large, it is the single largest tool the federal government uses to boost economic outcomes and build lifelong wealth for families. 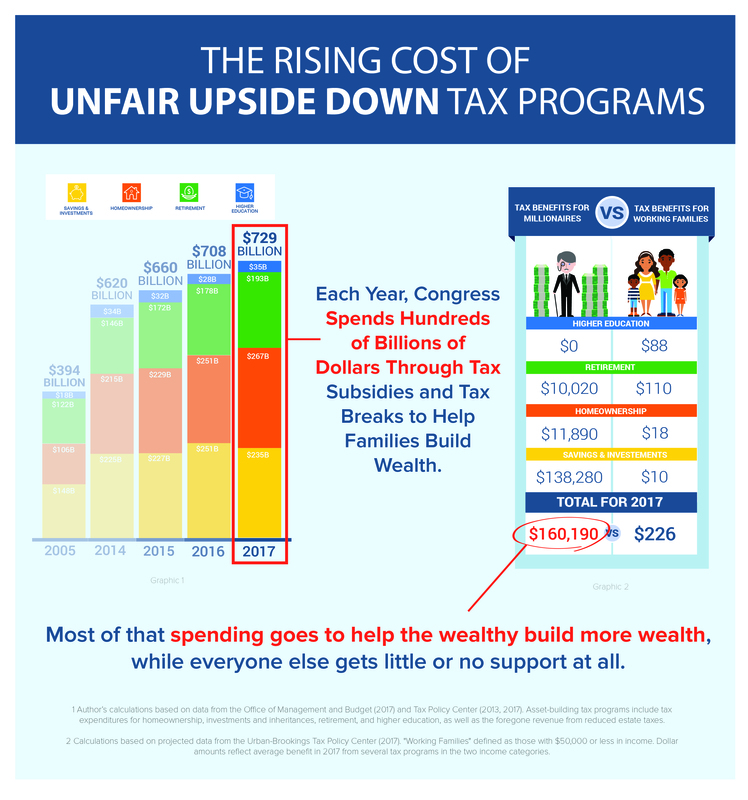 Unfortunately, the vast majority of this spending goes to help already wealthy families build more wealth instead of helping low- and moderate-income families achieve financial security, stability and, ultimately, prosperity. In 2017 alone, the federal government spent $729 billion through tax subsidies and tax breaks to help families purchase a home, attend college, and save and invest for the future. Except for the Department of Defense, this amount surpasses the combined budgets of all other cabinet level federal agencies. From this enormous investment in wealth-building tax programs, a millionaire last year received an average tax benefit of $160,000, while a working family earning about $50,000 received just $226. Unfortunately, instead of using our resources to build economic growth, the recently enacted Tax Cuts and Jobs Act of 2017 double downs on our tax code’s long history of expanding inequality rather than opportunity. It will use government funding to reduce the corporate federal tax rate, double the amount of inherited tax-free assets (like real estate or stocks), create tax-free shelters for private school through 529s and provide a lower tax rate on investment profits for hedge fund investors. Conversely, low- to middle-income homes will lose affordable health care, social security and tax breaks that made buying a home or pursuing education an attainable goal. Moreover, by providing subsidies almost exclusively to those with incomes of $730,000 or above, most of whom are White, the law will fuel the already-alarming levels of racial wealth inequality we face today to new heights. In doing so, the economic problems facing communities of color—who in just under a generation are project to command a majority of the population—will ultimately have an economic impact on all Americans, including White households. In short, this “tax reform” law puts the American middle class in jeopardy. It's time to call a spade a spade: the Trump-Ryan plan for "tax reform" is simply tax breaks for the wealth. This paper seeks to identify how—as a field—we can more effectively harness the power of activists to impact tax policy.